It’s nigh impossible to review A Midnight Visit. 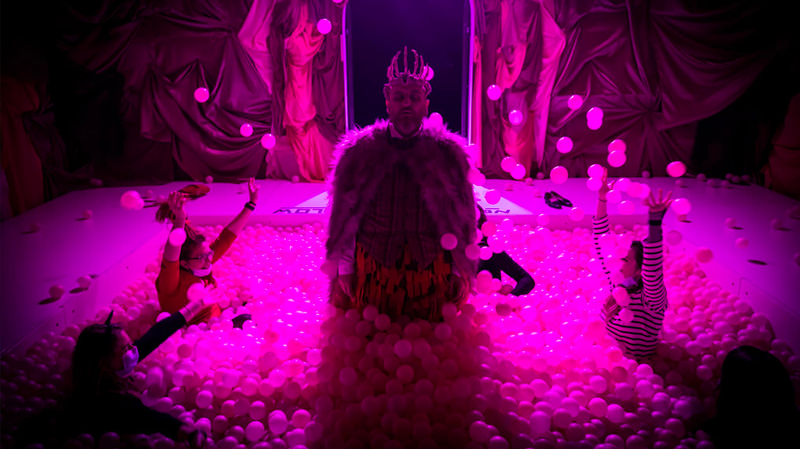 This piece of immersive theatre is unlike almost anything else at the moment, and far different to much of what I’ve experienced so far at Fringe. It produces an intensely personal experience, a variable and shimmering phantasm. Cloaked in the fevered dreams of a ghostly student obsessed with the writings of Edgar Alan Poe (a wordsmith that penned many of his own fever dreams), A Midnight Visit lets audiences loose into a sandbox of dark imaginings, set free to find their own wonders and nightmares. From the very first steps taken up to the Girls School, the beating of the telltale heart already reverberates in your ears, warning you of the Gothic terrors and delights in store. However, as you enter the dream, you a transported to another realm, one where the structure of the school no longer obeys that of its physical form. With a face mask on, to avoid the malignant disease that lingers in the school’s halls, you are set loose to wander through the dining rooms and corridors, ice caverns and warped fantasies that now inhabit the building. Scattered amongst this are various characters, ghosts and murderers, mortals and unearthly beings, plucked from the author’s work. Each might engage you, tell of a tale, sing of their desires, or engage in more cryptic ways, as you navigate this otherworldly landscape. As something akin to a “chose your own adventure” novel, everyone’s experience will be intensely personal and different. However here’s some realisations from my journey to help you on your way. Be willing to push the boundaries of you comfort zone and be brave. Be willing to engage, you get out of this what you are willing to put in. Be willing to explore, you will not be dragged through a narrative, but try and find your own. Be willing to tread your own path, for although you will find entertainment in a group, there is a moment of pure joy awaiting if you set foot alone. Be willing to be lost, for sometimes retreading you steps will often lead to new adventures, as you crawl, climb, or walk through ways that you missed before. For each of us that went that night, we had our own unique tale. Each of us had moments of personal wonder, that special experience that we had, that no one else had. Each of us also had a small regret for something that we had missed, in the vast sprawling maze of the school. Yet everyone of us was captivated, bewitched by the fantasy that had been woven before us, and the magic we had experienced.